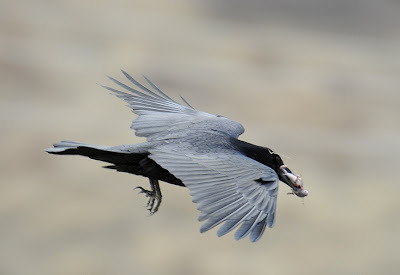 I was at the Dinosaur Ridge Hawkwatch (near Morrison, Colorado) today, and in addition to the raptors we counted was a Common Raven flying up and down the ridge with something in its bill. 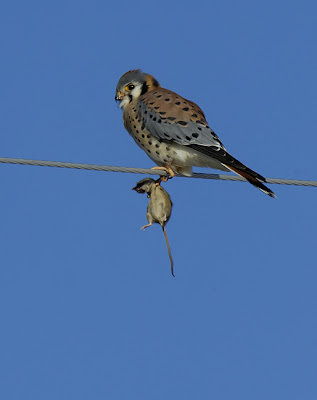 On the closest pass I snapped some pics and when I checked them out I saw that it was carrying a mouse. I wonder if it was flying up and down to show off to a mate? Mousie's what I love to eat. 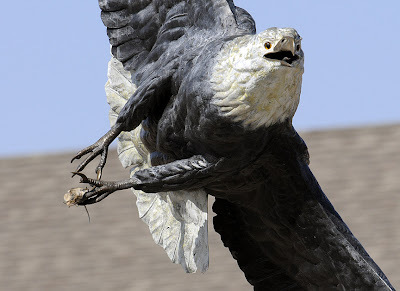 The Best Bird? 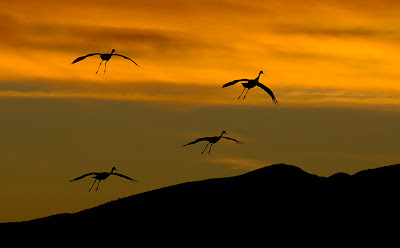 The Next Bird. The 6 words in the title say it all- well, at least they say it all for me as a birder in 6 words. That's the point of the 6-word meme that the Camera Trap Codger tagged me with- thanks, Codger! 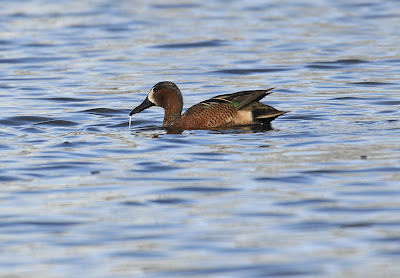 Oh, and for you equipment geeks, I was out at Walden trying my new camera body- a Nikon D300 that arrived last Thursday. Looks good so far and the 3" LCD is simply stunning, but I really haven't had the chance to put it through its paces yet. That will all change next week with a big crane and chicken chase in the first part of my spring break. The D2X is needing some maintenance and I can't bear the thought of spring birding without my DSLR at the ready. When I get the D2X body back, I'll be able to keep my big gun (Nikon 200-400 f/4 VR) on one, and my smaller 70-200 f/2.8 VR mounted on the other for flight grabs or wider-angle work. Stay tuned for updates- anyone out there running the D300 have tips for me?? No, not that Bird Chick... 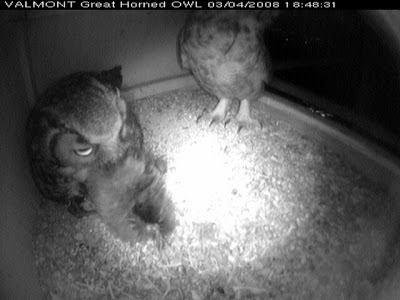 There's a new Great Horned Owl chick at the Valmont owl box- looks like a fuzzy little blob but not for long- these things grow fast. The other egg is still unhatched but should only be a day or two behind the first. 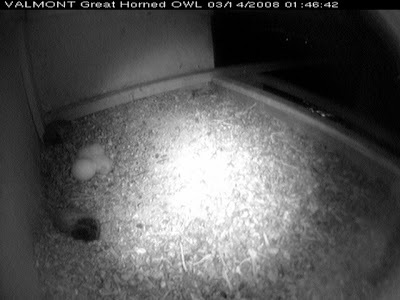 Later in the night the proud papa paid a visit and serenaded his family- check out how puffed up his neck is as he hoots: The instinct to keep the chick and its sibling well-fed is kicking right in- no more "down the hatch" when grub comes in for momma. Later in the night, two small rodents (mice?) 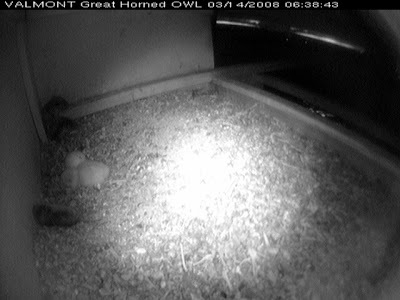 are stashed and by dawn there's a third ready to go when the chick gets hungry. 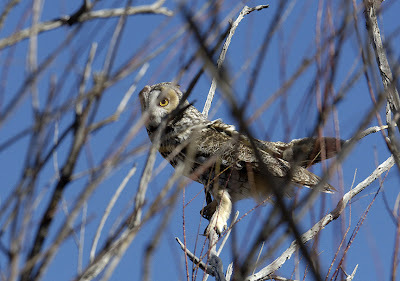 I was lucky enough to be invited on a Long-eared Owl survey on a private ranch in Eastern Colorado recently. 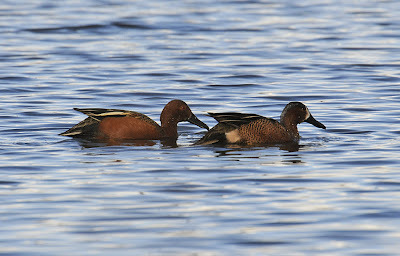 Soon the Long-eareds will be heading off to nest, but they can still be found in communal winter roosts. They like heavy cover- the heavier the better. In much of Colorado, the best cover comes from two invasive plant species- Russian olivie and tamarisk. 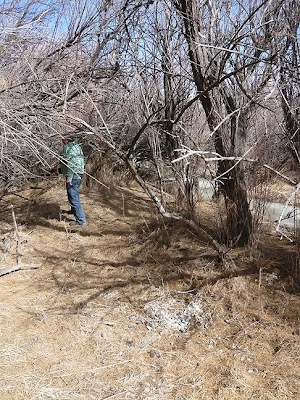 We checked a tamarisk-choked stretch of a little creek on the ranch, which is tough cover to get through- sometimes even requiring crawling (a fun task while trying to keep a big SLR rig out off the ground.) The best strategy was to look for whitewash and/or pellets under likely roosts, as spotting the birds before they moved back into more cover was very tricky. 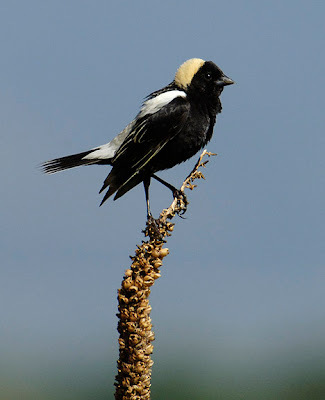 In the picture above you can see a pellet pile on the ground beneath a favorite perch. You may also notice whitewash on he branches above the pellets. 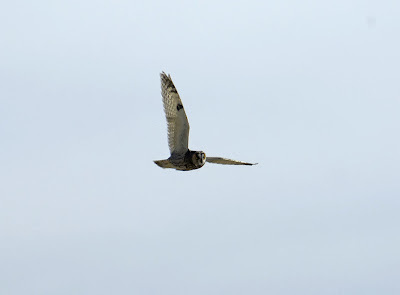 It appears as though a given owl will use the same perch for a long time- maybe all winter. 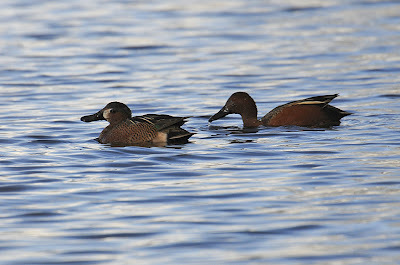 They perch fairly low- often about eye high. 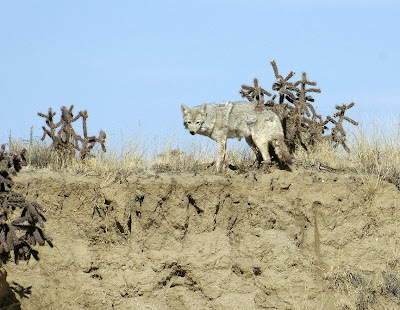 I'm guessing they don't want to be in easy reach of ground-based predators like coyotes or foxes, but not too high, either, where raptors or Great Horned Owls could spot them and pick them off. Whatever the reason, using the same roosting perch for a long time results in an impressive pile of pellets. Check out this pic, showing the foundation of old, crumbled pellets and the newer pellets on top. 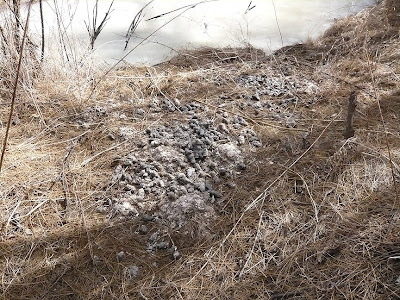 A roost like this would provide a great project opportunity for someone wanting to study the types of prey the owls are hunting based on the skeletal remains in the pellets, but I haven't the time or expertise to do so. 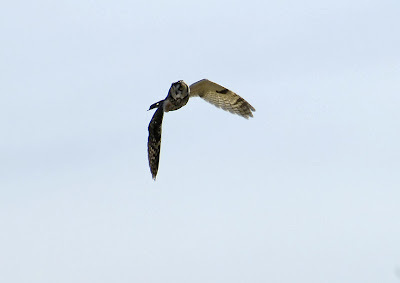 Getting a clear photo of a Long-eared Owl is a long shot- they inevitably keep branches between themselves and the lens, and often you don't see them at all until they move farther into their roost grove. Plus, we didn't want to push them around too much, opting to extract ourselves once we had a count estimate of the birds (a dozen or so in this roost.) I did manage one shot of a perched bird through some branches, however. Fortunately, due to the remote and private nature of the location, they might not see a human all year except for our brief intrusion. The tight tamerisk keeps cows out and hampers aerial predators, and the population there seems impressive. 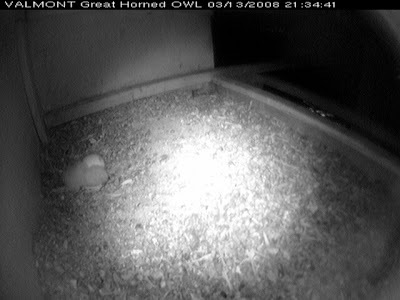 I wonder how far afield they go at night- with a dozen or more owls in the roost it would seem like there wouldn't be much in the way of rodents left very close. As we left the grove, one owl came back from a satellite patch of tamerisk to join its buddies in their thick grove. It was being buffeted up and down in the strong prairie wind, but I got a few shots of it that are kind of cool. It is always good to get out into the open country of Colorado's short-grass prairie. 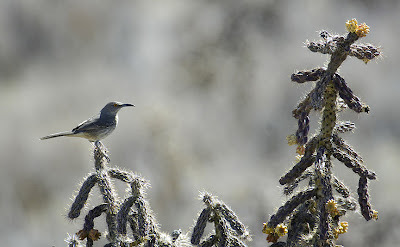 This ranch also has cholla cactus patches, favorite haunts of Scaled Quail and Curve-billed Thrasher. 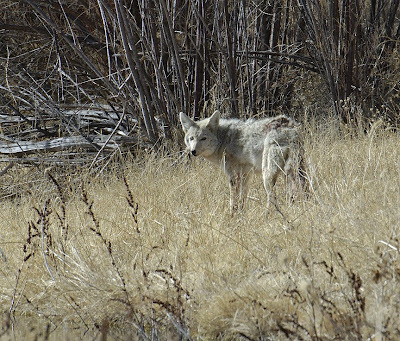 We also got the hairy eye from a coyote. I didn't notice it at the time, but it looks like it got into some tussle and has a wound on its left hip. It moved with the normal fluid grace of the species, sans limp, so I hope it is just a superficial injury. It easily sprang up the bank of an arroyo, took one more reproachful look at us, and disappeared over the bank. 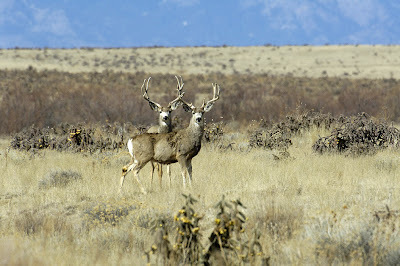 I also enjoyed seeing these two mule deer bucks who were eying our group. I wonder how long they will hang onto their antlers before shedding them. 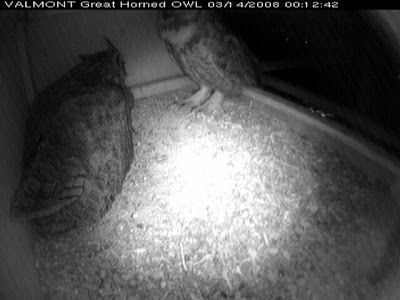 Special delivery at the Valmont Great Horned Owl box last night... Mom polished the whole squirrel off in a couple of minutes. Yum.